Myelomeningocele is a defect of the spine, and of the passage inside the spine called the spinal canal. It can occur at any point along the spine. During early fetal development, the spine comes together like a zipper covering the spinal cord and nerves. Incomplete closure of the spine is referred to as spina bifida, or a neural tube defect. Myelomeningocele is the most common form of the spina bifida, in which the spinal cord and the tissue around the cord (meninges) protrude from the baby’s back. There is no skin covering the defect. This type of defect happens in about 1 in every 1,000 pregnancies. Taking folic acid (vitamin B9) before pregnancy has reduced the frequency of this birth defect. VIDEO: What is Spina Bifida? There are other types of spinal bifida. One type, spina bifida occulta, occurs when there is skin covering over the bony defect in the spine and the spinal cord remains in place. Another type of spina bifida, meningocele occurs when there is a bony defect in the spine, but only the tissue that covers the spinal cord is out of place. The University of Michigan C.S. Mott Children’s Hospital is a leader in the diagnosis, treatment, and management of myelomeningocele. Our Fetal Diagnosis and Treatment Center specializes in prenatal diagnosis, management, and treatment before a child is born. Our multidisciplinary Spina Bifida Clinic, led by one of the nation’s top pediatric neurosurgery programs according to U.S. News & World Report, combines the expertise of our neurosurgery, orthopedics, urology, physical therapy and other pediatric subspecialties to address the complex needs of patients with these congenital spinal cord abnormalities after birth. Together, these seamlessly linked programs offer fully integrated care for families, ensuring individualized, coordinated care for children with myelomeningocele and their families. Many women have a prenatal blood test during the second trimester. This test is called a quadruple screen (quad screen). It is a screening tool doctors use to check for fetal problems. One of the blood levels this text checks is called AFP (alpha-fetoprotein). This level will be higher than normal if there is an opening in the spine, or in another area of the baby’s body. This lab result, with an ultrasound, detects over 90% of babies affected with a neural tube defect. An amniocentesis is recommended for fetuses diagnosed with myelomeningocele. There is an increased chance of chromosomal problems with this defect. A fetal echocardiogram is recommended when there is suspicion of a heart defect. A fetal MRI may be used to further assess the brain and spine when more information is needed. Fetal surgery for spina bifida involves covering the myelomeningocele with multiple layers of the fetus’s own tissue during the mother’s pregnancy. This procedure offers a rare opportunity to improve the outcome for the developing baby. As with any fetal surgery, the potential benefits must be weighed against the possible risks for both mother and baby. The University of Michigan Fetal Diagnosis and Treatment Center follows criteria established by the MOMS trial to determine if a patient is a candidate for fetal surgery. A complete fetal evaluation will be conducted, which involves an ultrasound, fetal echocardiogram, and fetal MRI performed at our center. Candidates meeting inclusion criteria will meet with our multi-disciplinary team, including maternal-fetal medicine, neurosurgery, anesthesia, neonatology, and social work to discuss the procedure along with its risks and benefits. Fetal surgery of this type requires a team of highly-skilled professionals in a variety of specialties. At the University of Michigan, families have the confidence of receiving treatment at one of the few centers in the U.S. where the birth center and children’s hospital are located in the same building, allowing for advanced care for neonates immediately upon delivery and enabling mother and baby increased access for the duration of their care. Our fetal myelomeningocele program draws upon the full resources of U-M’s C.S. Mott Children’s Hospital, bringing together our renowned maternal fetal medicine and fetal surgery teams with our accomplished pediatric neurosurgery team to provide deep experience and a broad spectrum of expertise for each patient. Regular ultrasounds are used to monitor the baby’s overall growth and well-being. These are scheduled every few weeks as the pregnancy progresses. Other antenatal testing may be needed if there other findings or for obstetrical reasons. Delivery is usually planned around 39 or 40 weeks. The delivery of a baby with any type of spina bifida should be at a hospital that is prepared for high-risk births, including immediate access to a neonatal intensive care unit and pediatric surgical services. This will simplify communication between obstetrical, neonatal and pediatric surgical teams as well as limit the separation between mother and baby. University of Michigan is one of only a few centers nationwide at which the birth center is co-located within a comprehensive children’s hospital. This unique setting allows for seamless integration between our private-room birth center, state-of-the-art newborn intensive care unit (NICU), and access to around-the-clock pediatric surgical services in one convenient location. The method of delivery for babies with a myelomeningocele remains under debate. There is no clear evidence that having a Cesarean section will improve the outcome of these babies. However, a C-section may be needed for an obstetrical reason, such as for a baby with very large ventricles who has an increased head circumference. A vaginal delivery is recommended whenever it is a safe option. The majority of babies with spina bifida are repaired after birth. It is important that the baby be handled carefully to protect the exposed spinal cord. This may include using a protective device and special positioning. An operation to close the defect will be done within the first 48 hours to preserve the neural tissue and to prevent infection. About 80% of the babies develop increased fluid around the brain after surgery. This increased fluid around the brain is called hydrocephalus. When this happens, a second operation is needed to reduce pressure caused by the fluid. With this surgery, a small drainage tube (shunt) is placed to redirect the extra fluid. This tube is called a ventricular peritoneal shunt, or VP shunt. Antibiotics are given to prevent infections. The most common places infection occurs in these babies are the protective lining of the cord (meninges) and the urinary tract. In general, the location of the defect generally determines the level of function to the lower parts of the body. These children often require lifelong assistance and the guidance from multiple specialties. Some common problems include bladder and bowel training, reduced muscle strength, and mobility issues. Some children may have some degree of learning disability. Latex allergies are more common with these children. This is because they need many operations and procedures throughout their lifetime. Latex items of any kind should be removed from the environment beginning at birth. C.S. Mott Children’s Hospital takes this precaution very seriously, removing all latex products from the operating room environment. 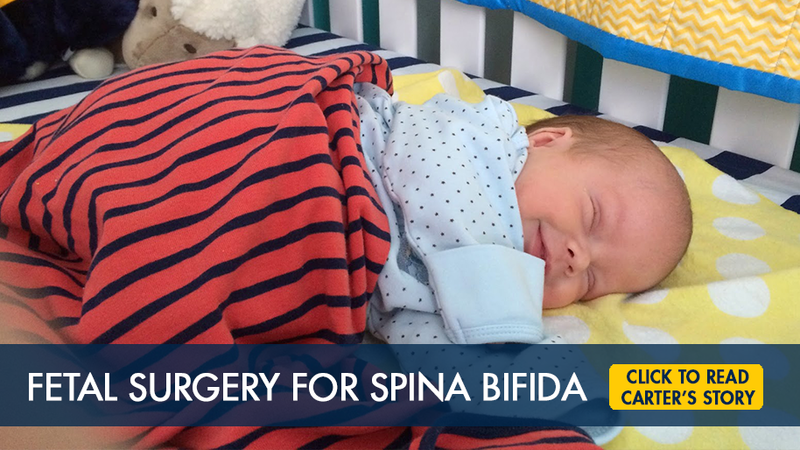 VIDEO: How do we treat spina bifida after a baby’s birth? As children with myelomeningocele grow, we offer seamless transition to our multi-disciplinary Spina Bifida Clinic, led by one of the nation’s top pediatric neurosurgery programs according to U.S. News & World Report. The Spina Bifida Clinic at the University of Michigan combines the expertise of the Departments of Neurosurgery, Pediatrics, Orthopaedics, Urology, Physical Medicine and Rehabilitation, and other specialties to address the multiple medical needs of patients with these congenital spinal cord abnormalities. This multidisciplinary approach ensures that optimal and individualized care is provided to each patient in a regular and timely fashion. Myelomeningocele is related to many factors. The chance of it happening again in another pregnancy is around 3-5%. Those who have a family history of spina bifida have a higher chance of recurrence. Folic acid, vitamin B9, should be increased before pregnancy if there is a family history. It is recommended that women planning a pregnancy take 4mg of folic acid each day before conception. The recurrent risk is different if the defect is related to a chromosomal problem. Your doctor and genetic counselor will discuss the risk in your family. Schedule an appointment by calling us at 734-763-4264.